Color postcard view of WWI subchasers. 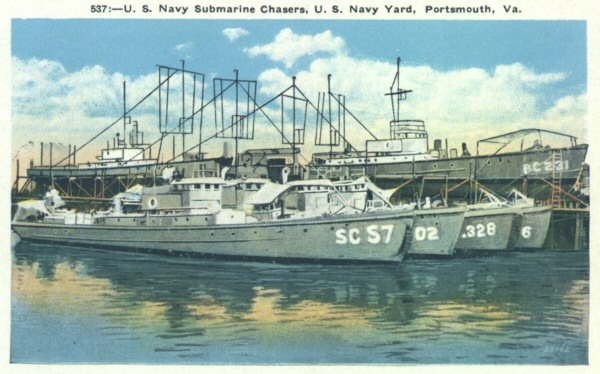 The class of vessel known as the “Subchaser” originated during World War I. In 1916 the United States was still neutral but during that summer two German submarines visited the U.S. and shortly after leaving audaciously sank five ships. This galvanized the navy into action. Spurred by a young Assistant Secretary of the Navy named Franklin D. Roosevelt the navy undertook its own design for an effective antisubmarine vessel. Just as in the second World War, steel was scarce, as was the capacity of big shipbuilding yards already fully contracted to build destroyers and other larger ships. Roosevelt invoked naval architects to come up with a suitable design for a subchaser made of wood. The idea was to build them quickly in small boatyards, using people with the necessary skills in wooden boat construction to get the job done. A naval architect, Albert Loring Swasey was commissioned by Roosevelt to design a subchaser that would have the seaworthiness and the endurance necessary to be effective against the U boats. Swasey came up with a triple-screwed vessel 110' long with a 16' beam, powered by three Standard 6-cylinder, 220-horsepower gasoline-driven engines. The popular view was that a subchaser should be very fast but Swasey disagreed, maintaining that extreme speed was not worth the price in the sacrifice of seaworthiness, cruising range and comfort. Despite a storm of criticism from shipbuilders who anticipated speeds of at least 30 or 40 knots he went ahead with preparations to have the boats built with a top speed of 17 knots and a cruising range of 1000 miles. He designed a bow flare similar to that of a big whaleboat with its hull cut off at the water line aft - a design unsurpassed for sea work since the time of the Vikings. The SC-1 class subchaser had a displacement of 85 tons and a complement of two officers and 24 enlisted men. The armament consisted of two 3"/23-caliber guns and two machine guns. Later on a depth charge projector or Y-gun was substituted for the after 3-inch gun and it proved to be the most effective antisubmarine weapon of all. There being no electronic sonar in those days the vessels were equipped with underwater hydrophones for detecting engine and propeller noises. By the time the war ended 440 SC-1 class subchasers had been completed and placed into service. One hundred were sold to France and another 121 craft manned by American crews crossed the Atlantic under their own power, refueling at sea from tankers accompanying or being escorted. The subchasers in Europe operated in the approaches to Britain and France and in the Mediterranean and those in the United States combined with destroyers in operations off the east coast against the U boats. 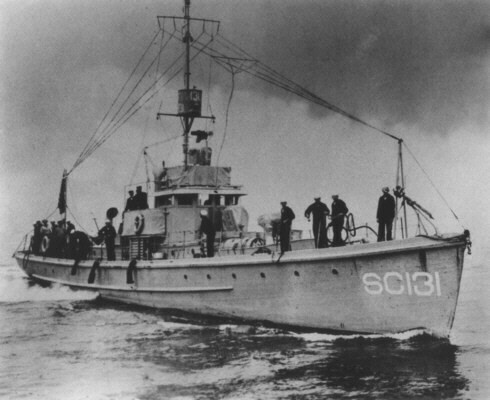 SC 131 - A World War I SC-1 class subchaser. At first glance the two generations of subchasers appear quite similar but the WWI subchasers were 2' narrower of beam and had radically different propulsion systems and armament from those of World War II. The gallant little SCs of WWI ranged far and wide, completing missions as far north as Archangel, Russia, inside the Arctic Circle. Many SCs were captained by enthusiastic amateur yachtsmen with Ivy League backgrounds and the same air of informality and relaxed discipline as seen on SCs of WWII. Officers and crew were a close-knit group, almost to a man recruited from the Naval Reserve. The small size of the ships and the informal, non-conformist ways of their men earned them the label “Cinderellas of the Fleet,” and “Splinter Fleet.” They were a hardy lot. At sea the conditions were grueling, uncomfortable, and definitely not for the fainthearted. The constant pounding, rolling and pitching of the vessels was unremitting and unforgiving. The history and performance of the World War I subchasers has been debated by historians. One source says the SC-1 class subchaser was the most important weapon of the war and credits them with destroying 40% of the U boats sunk in the war. Another source takes a diametrically opposite view, saying “The submarine chasers never fulfilled the hopes placed in them and never achieved a single kill.” Nevertheless everyone is in agreement that they were an effective antisubmarine deterrent. In an operation in 1918 known as the “Otranto Barrage” a dozen or so American subchasers helped keep the U boats bottled up in the Adriatic, unable to escape to the open sea to press their attacks. By denying the Germans the offensive power of their U boats at this critical stage the Otranto Barrage was perhaps the greatest single contribution of the subchasers in World War I. And on 2 October 1918 eleven SC-1s blew up enemy mines in the Austrian harbor of Durazzo, thus insuring their role in the only general naval engagement by the American navy in the war.